Thanks to the sharing economy, people who need a certain product or service are easily digitally connected to people willing and able to provide that service or product. As a result, platforms like Supshare that offer these solutions to users tend to focus on an idealistic future and the positive aspects of their solutions, rather than on the responsibilities that accompany building their platforms. This paper takes a critical look at this ‘solutionism’. The sharing economy is becoming more and more well-known. The term appears in media daily and these days only a few amount of people might not have heard from companies like Wikipedia, Peerby and Uber. The sharing economy creates space for people to bring together their supplies and demands without necessarily including a third party: think of the way crowdfunding works for example. Crowdfunding connects people who are looking for money with those who have the financial means to invest in a project. Platforms such as Kickstarter bring together these people without the need for help from someone else. One of the most well-known examples of solutions that are created this way are peer-to-peer platforms. When it comes to different sectors people come up with a myriad of solutions. Take the transportation sector and Snappcar for example: through this platform it’s possible to rent a car from people across the street, taking away the need for some people to buy their own car. Many of these companies pride themselves on the fact that they have idealistic goals and a good impact on the world. Lower CO2 emission rates, more knowledge accessible for more people and humans being able to do things they wouldn’t have been able to do before are just a few of the solutions these companies claim to offer the world. But how do these solutions measure against monetary and self-interested goals that people might have? In their research, Victoria Bellotti et al conclude that some people might care about social motivations, but “on the other hand, user-providers are highly motivated by payments and user-receivers are far more interested in getting a service or good and increasing value (getting a better deal) than providers seem to anticipate” (Bellotti et al, 1090). The food sector is another sector where new platforms are emerging in the sharing economy. There are people who can cook very well and make (too) much food happily, and there are people that do not enjoy this activity nearly as much. Despite their differences there is one important common factor they share: food. An emergent platform in Amsterdam right now is Supshare, they are looking to fulfill this gap. This online platform allows its users to sell homemade leftovers to neighbors. This creates a solution for people who are less culinary minded as well: they are able to pick up these dishes for a nice price while getting to know their neighbors simultaneously. The two solutions Supshare claims to provide is firstly to create stronger socially cohesive communities in a neighborhood and secondly to combat food waste. Literature is riddled with the positive effects of the sharing economy on problems that were previously “less solvable”: “Prior to the emergence of sharing-economy platforms, governmental intervention was a natural solution to market failure in traditional peer-to-peer businesses” (Cohen, 121). Many optimists focus on the way third party intermediaries like for example Lyft are now able to provide alternative, or better solutions. The key issue with this ‘solutionism’ is that people might define complex social situations as neatly defined problems and this will have unexpected consequences. “Recasting all complex social situations either as neatly defined problems with definite, computable solutions or as transparent and self-evident processes that can be easily optimized – if only the right algorithms are in place! – this quest is likely to have unexpected consequences that could eventually cause more damage than the problems they seek to address” (Morozov, 16). In reality, it appears the world is infinitely complex and humans cannot oversee all the nuances that problems they are trying to solve have. With Airbnb for example, recently there has been much debate about the negative consequences this has on the lives of local residents in big cities. With Supshare, similar problems might arise. If we look at human decisions made as a homo economicus wanting to maximize profits, one might decide try to sell their food for profit to lower their own costs for cooking. When people start cooking more for financial incentives, the expected solutions like less food waste and more social connections do not work out as planned. People will cook more to sell afterwards, and they will see their neighbors as potential buyers instead of potential new friends. The platform allows sellers to “set a price that you think is fair”, allowing people to make profit. In addition, when believing that there are benign solutions to everything, one might quickly jump to conclusions and try to offer a solution while a specific problem has not even been identified yet. When trying to solve problems like too much food waste and lack of social cohesion in neighborhoods by nudging people in the direction of selling their products to neighbors, the techniques are merely oriented towards producing outcomes, not any form of substantial social or moral progress. Before coming up with a solution to a problem, might it not be better to take a close look at the problem at hand? Instead of focusing on a solution, one might start asking questions like ‘why does little connection between neighbors exist in Amsterdam’? ‘Is it really true, and if it is, why do people often cook too much and end up throwing it away’? ‘Are there ways in which these problems could be prevented’? In ‘Debating the Sharing Economy’, Juliet Schor also takes a critical look at the often made claim that these new peer-to-peer technologies yield utopian outcomes. About the greenness of the platforms offering new “solutions” she says the following: “…they are likely creating economic activity that would not have existed otherwise – more travel, more private automobile rides – and not just shifting purchasing from one type of provider to another” (Schor, 7). With Supshare the unintended consequences could include people driving cars to pick up food for example, making it difficult to discern whether the fact that at least the food was not thrown into the bin outweighs the car’s CO2 emissions. As concluded in their research by Bellotti et al, providers place great emphasis on idealistic goals, but “users, on the other hand are looking for services that provide what they need whilst increasing value and convenience” (1092, Bellotti et al). It is clear that the founders of Supshare had positive intentions when trying to solve problems in Amsterdam through the means of digitally connecting people on their platform in the sharing economy. However, it is important to keep in mind the problem itself and give this priority over trying to come up with a solution. Martucci, Brian Martucci Brian. 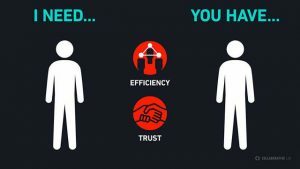 “What Is the Sharing Economy – Example Companies, Definition, Pros & Cons.” Money Crashers, www.moneycrashers.com/sharing-economy/. Bellotti, Victoria, et al. “A Muddle of Models of Motivation for Using Peer-to-Peer Economy Systems.” Proceedings of the 33rd Annual ACM Conference on Human Factors in Computing Systems – CHI ’15, 2015, doi:10.1145/2702123.2702272. “Supshare • Food From Your Neighbourhood!” Supshare, www.supshare.nl/. Oram, Andrew. Peer-to-Peer: Harnessing the Power of Disruptive Technologies. O’Reilly., 2001. Cohen, Molly, and Arun Sundararajan. “Self-Regulation and Innovation in the Peer-to-Peer Sharing Economy.” http://Adapt.it/Adapt-Indice-a-z/Wp-Content/Uploads/2015/06/Sundararajan_Cohen_Dialogue.Pdf. Morozov, Evgeny. “To Save Everything, Click Here: the Folly of Technological Solutionism.” Choice Reviews Online, vol. 51, no. 01, 2013, doi:10.5860/choice.51-0324. van Sprang , Harmen, and Pieter van de Glind. “Het Ecosysteem Van De Deeleconomie.” NRC Live, 30 Jan. 2017, nrclive.nl/share-nl/. Sunstein, Cass R., and Richard H. Thaler. “Libertarian Paternalism Is Not An Oxymoron.” SSRN Electronic Journal, 2003, doi:10.2139/ssrn.405940. Schor, Juliet. “Debating the Sharing Economy.” Great Transition Initiative, Oct. 2014, www.greattransition.org/publication/debating-the-sharing-economy. « Talkspace: how reliable and responsible is mobile psychotherapy app? Commons-based peer produsage? Rethinking online production.